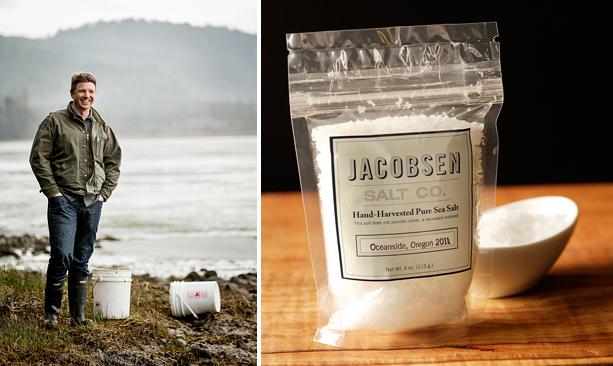 Ben Jacobsen’s obsession with salt began when he was finishing his MBA in Copenhagen, and a friend gifted him with a bag of fleur de sel. Until that point, he had never given much thought to the ubiquitous seasoning. As a self-professed non-cook, he was amazed by the ability of good crunchy salt to elevate simple pleasures – and used it on everything from fried eggs to hamburgers. He spent the next few years traveling around the world, amassing an arsenal of hand-made salts from around the world. When he returned home to Oregon, he was surprised to learn that even though the United States was the leading producer of commercial salt – nobody was making the good stuff. At the time the food scene in Portland was just taking off, and while the chefs and foodies praised everything local, the finishing salts they used were hailing from across the pond. Brittany, France is home to Fleur de Sel, where miles of channels through gently sloping marshlands purify and concentrate the salt content before it reaches the salt flats. As the salt crystallizes under the warm sun, highly trained palladiers gently scoop out the prized crystals of fleur de sel as they form on the surface of the flats. Which is great; if you live in an area with consistently warm sunny days, and a gentle coastal breeze. Lacking Brittany’s ideal climate in notoriously damp Oregon, Ben went the route of Maldon, an equally famous finishing salt from the equally drizzly country of Wales. And so he got to tinkering. On days that his crabbing excursions left him empty handed, he would lug buckets of saltwater back 90 miles inland to Portland. Since nobody else was making artisan salts at the time, he had to reverse engineer the process. He knew that getting to the salt would involve evaporation, and so he would boil the water off on his stove, and wait for his precious crystals to form. The first batches weren’t the best, but showed enough promise for him to leave his career in the tech industry and seek out a commercial cooking space to begin producing in earnest. While researching, he learned that he wasn’t the first person to harvest salt from coast of Oregon, Louis and Clark had spent a few months boiling down seawater to crystallized salt in an effort to avoid bland food on the return journey. Ben’s first step was to source the best quality seawater. 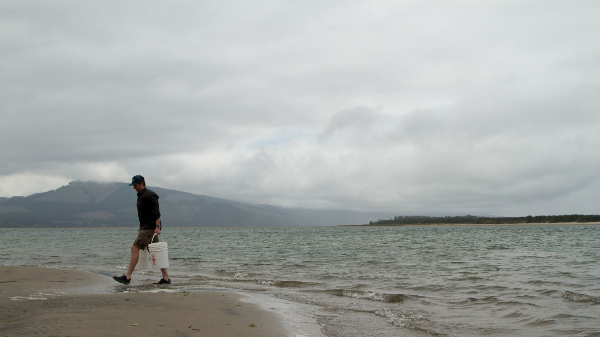 He made test batches of salt sampled from thirty different locations up the coast of Oregon and finally settled on water from Netarts Bay. The next step was to fine-tune the process. 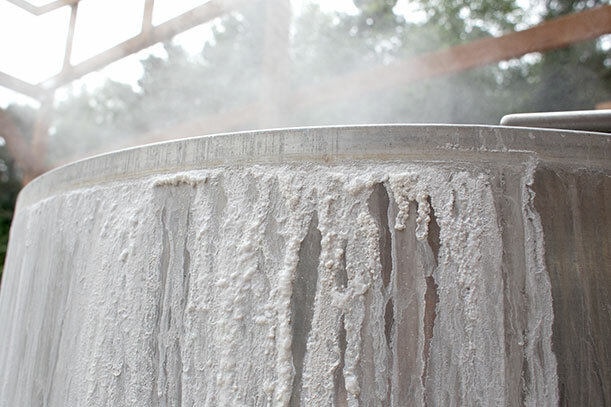 He began using a variety of filters and processes to remove the minerals responsible for bitter off-flavors, and had stainless evaporation pans custom-made. The process takes 14 hours to get from salt water to flake salt..
Once Ben fine-tuned the process, it didn’t take long for both local and world renowned chefs to sing his praises: Thomas Keller, Paul Kahan and April Bloomfield are all big fans. 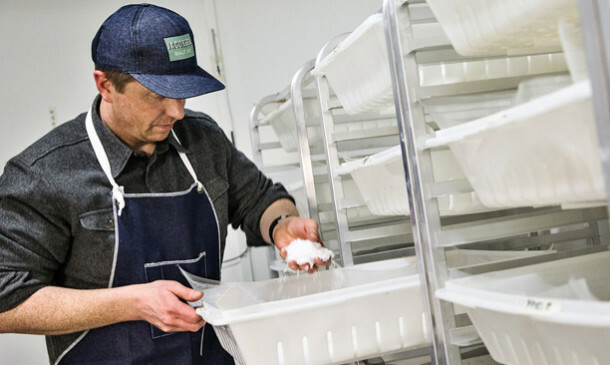 As demand for his product grew, he moved his business from the commercial kitchen space in Portland, to a 3,500 square foot decommissioned oyster farm on Netarts bay. While the larger space allows him to keep up with demand, his process remains steadfastly low-tech. A new retail warehouse space in Portland doubles as a event space for visiting chefs to host pop-up dinners featuring his salt. At Great Ciao we’ve also jumped on the American-made finishing salt bandwagon. 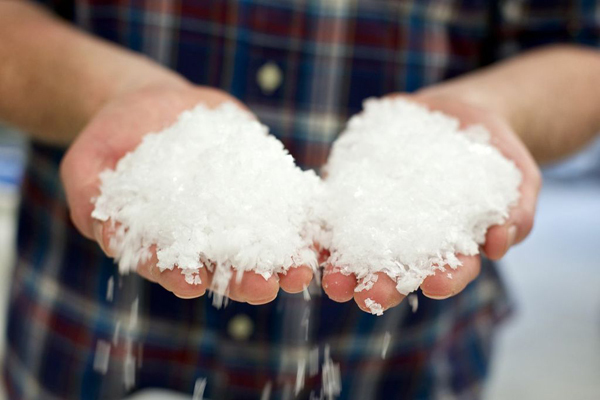 Jacobsen Flake Salt is available in both foodservice and retail sizes. Ask us for a taste! Tasting Notes: Jacobsen Flake Salt is clean, bright and a little sweet, with large pyramid shaped crystals and a delicate crunchy texture. Perfect as a finishing salt for just about everything.